Sam Milby talks about working with Queen of Teleserye Judy Ann Santos and his indie film 'Death March' screening at Cannes Film Festival. 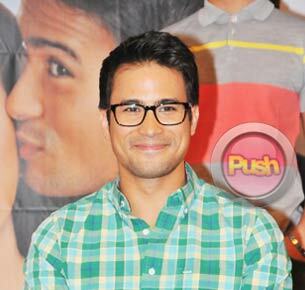 Sam Milby was quick to refute speculations that his recently-concluded teleserye Kahit Konting Pagtingin was cut short due to low ratings. Previous reports also mentioned that his co-star Angeline Quinto had been constantly criticized for her acting skills which might have affected the soap’s performance. “No, it’s not that. The plan really was for it to run for 13 weeks. Naka-13 weeks naman. That was really the plan,” said Sam in an interview with Push.com.ph. Although he didn’t have the chance to watch Judy Ann’s previous soaps, Sam attested to the fact that she hasn’t lost her sparkle to this day. “Yung working relationship namin, hindi naman ako lumaki dito sa Pilipinas, I didn’t get to watch her projects. But working with her sa mga eksena, magaling talaga si Judy Ann. Sometimes nai-intimidate ako kasi ang galing talaga. Tapos minsan sa eksena nabubulol ako minsan lalo na kapag kasama ko siya kasi prine-pressure ko sarili ko.” Sam added that he reads Tagalog tongue twisters everyday to improve his grasp of the language. In the meantime, Sam is thrilled because Adolfo Alix Jr.’s indie movie Death March—where he is top-billed together with Zanjoe Marudo, Ejay Falcon, Carlo Aquino, and Sid Lucero—will be screened at Cannes Film Festival next month. The said indie film will be pitted against 14 other foreign entries for the Un Certain Regard Section, along with another Filipino film, Norte, Hangganan ng Kasaysayan, directed by Lav Diaz.